Click button to add the promotion line item. Repeat step 4 to add more promo items into the promotion scheme. 5 . 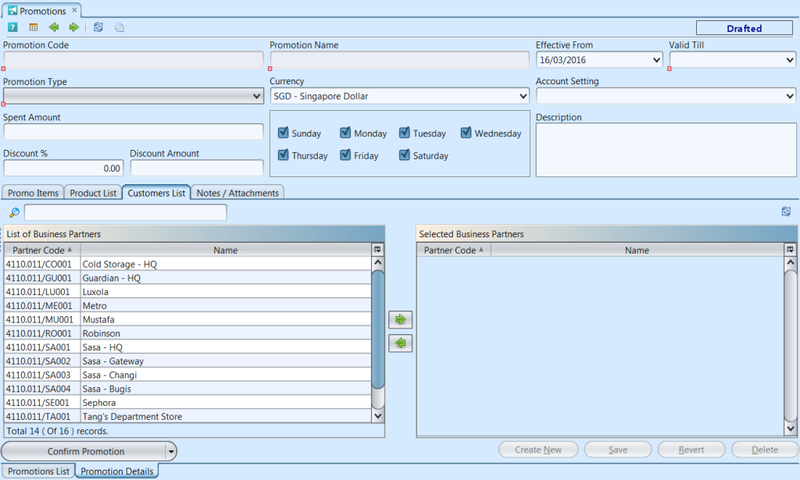 For certain promotion schemes, user is required to assign product(s) as the qualifying / participating products. The “Product List” tab will be available for selection in this case. 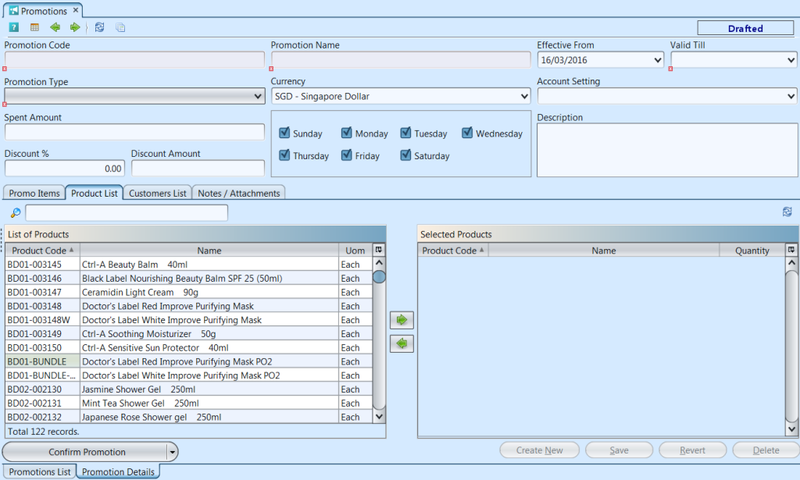 Click on the “Product List” tab, select product(s) and assign them into the promotion scheme. 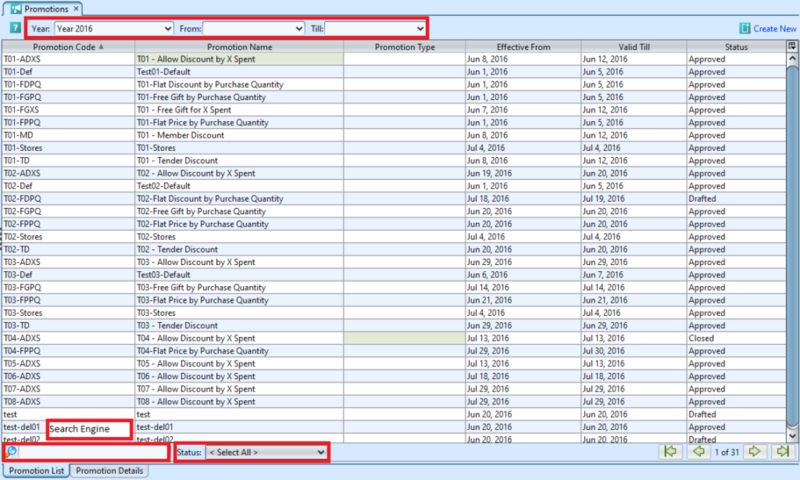 For “Purchase by Quantity” type of promotion scheme, user must defines the qualifying quantity here for each assigned product. 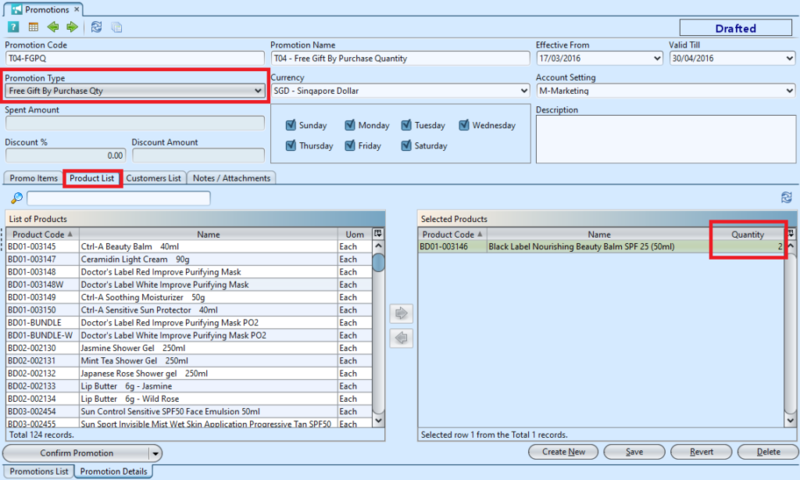 Double click on the line item “Quantity” to edit the quantity of the selected product. When customer purchase any product from the list, the system will check whether the promotion’s condition(s) were met, and apply the promotion to the sales transaction when the transaction document is confirmed. Example 1: Promotion Type is Free Gift by Purchase Qty. 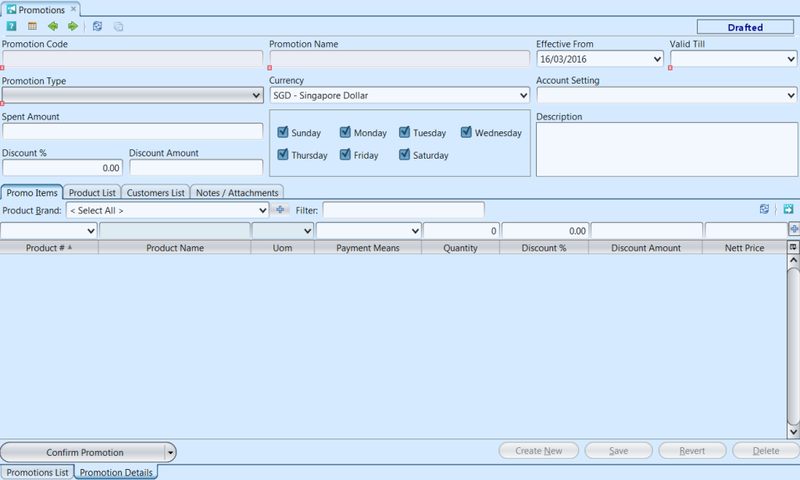 Example 2: Promotion Type is Allow Discount by X Spent. Promotion = Customer will get 20% discount when purchase BB Cushion if spend $200 in total. 1. Double click on promotion scheme to be deleted, it will bring up the selected promotion details on the “Promotion Details” tab. If a promotion scheme’s status is “Confirmed” or “Approved”, right click on the scheme and reopen* the scheme first. 1. Double click on promotion scheme to be closed, it will bring up the selected promotion details on the “Promotion Details” tab. The promotion scheme’s status must be “Approved”, for user to be able to close it. 3. Click on “Yes” button on the pop-up window to confirm closing* promotion scheme. *Note: Closed promotion cannot be reopened! 1. 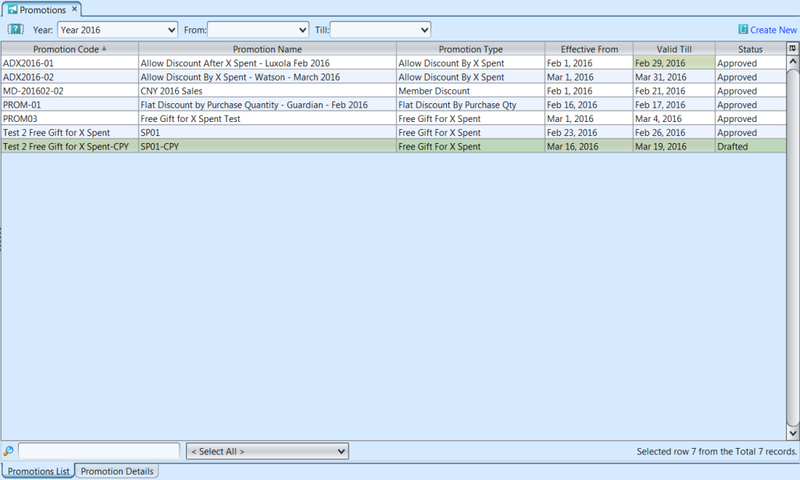 Double click on promotion scheme to be copied, it will bring up the selected promotion details on the “Promotion Details” tab. 3. Click on “Yes” button on the pop-up window to confirm creating a copy of the promotion scheme. 3. 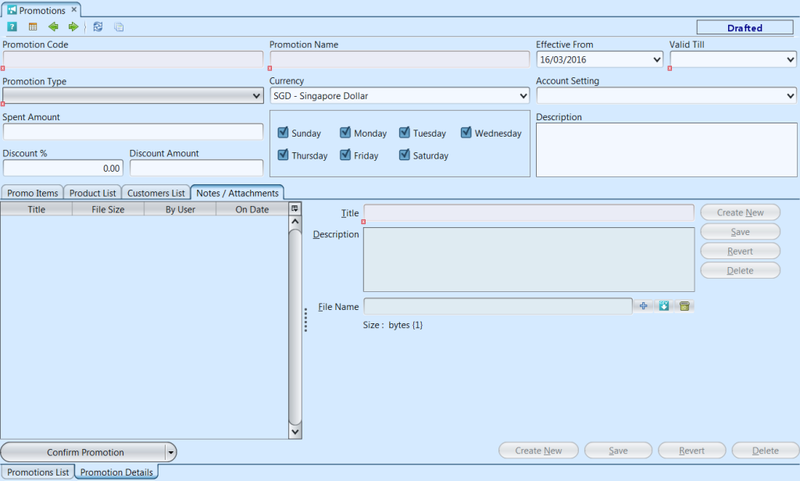 Select promotion schemes / lines from the list view and right-click mouse. This will open options available to the selected line(s).